Evolutionary biologist Connie Barlow predicts climate change could devastate Colorado’s trees before the end of the century. 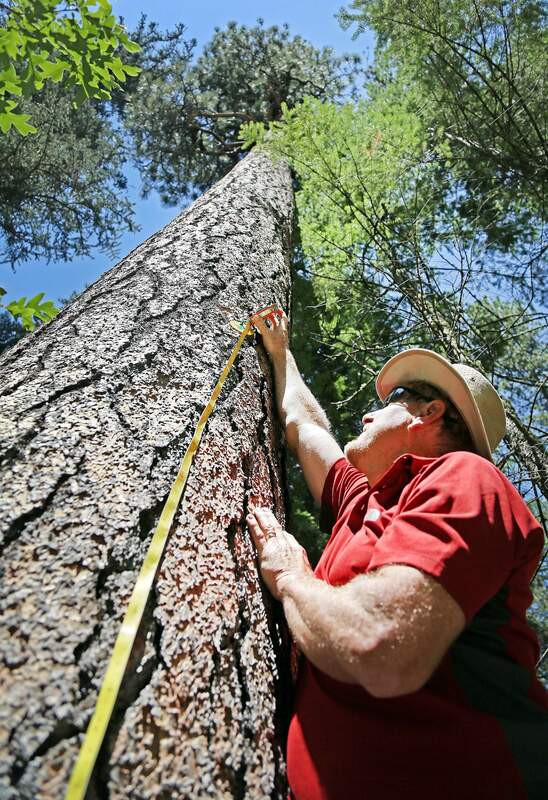 In 2012, Steve Colburn of Laser Technology Inc. measured the ponderosa pine named “Faye Schrater.” About 175 years old, the tree, which stands adjacent to the Hermosa Creek Trail, is more than 160 feet tall with a girth of at least 9.5 feet. The tree is believed to be the tallest of its species in the Rocky Mountains. In the context of climate change, much is depressing. Despite decades of grave, increasingly urgent warnings from scientists about human-caused global warming and overwhelming evidence that industrialization has heated our planet, governments have not gone far enough to curb carbon emissions. Judging by the 40-strong crowd’s reaction to her slides, which included sharp intakes of breath, mournful sighing and head shaking, Barlow made good on her promise to devastate the room. “Trees are the most vulnerable of any life form. Yet when we think about it, they provide the scaffolding for everything that is in a wild land, or it becomes a desert,” she said. One by one, Barlow presented scientific modeling on 10 species of wild trees in growing in Colorado: the Engelmann spruce, Douglas fir, whitebark pine, limber pine, lodgepole pine, piñon pine, ponderosa pine, Rocky Mountain bristlecone pine and white fir. Each species was all but decimated by 2090. “Here’s the whitebark pine,” Barlow said. Projected on a huge screen, the model showed plentiful, wide streaks of whitebark pine growing in America and Colorado today. As temperatures rise over the decades, trees will become more vulnerable to fire, disease, drought and pests. Unlike other species such as rabbits, which can move of their own will and reproduce frequently, trees regenerate on average every 30 years and cannot seek hospitable lands. Barlow displayed a giant photo of whitebark pine growing in the wild, and suddenly the presentation took on the funerary feeling of the Academy Awards’ “dearly remembered” segment, in which the Oscars broadcasts images of film professionals who, to viewers’ dismay, have died. “Just take in what’s going to happen to these trees,” Barlow said. She pointed to piñon pine. By 2060, the model showed piñon pine all but disappearing from Colorado. Barlow’s presentation relied on data about tree species collected by the Forest Service and used the well-established climate-change forecast produced by the Canadian Center for Climate Modelling and Analysis. For perspective, Barlow quoted an academic paper, the obscurely called Cenozoic Climate Change Shaped Evolutionary Ecophysiology of the Cupressaceae Conifers, about climate change that may have killed the dinosaurs. She said the life-killing effects of global warming will have on the environment are routinely ignored by the media. She pointed to a rare exception, a recent New York Times op-ed by former U.S. Treasury Secretary Hank Paulson, who oversaw the bailouts during the financial meltdown in 2008. “For too many years, we failed to rein in the excesses building up in the nation’s financial markets. When the credit bubble burst in 2008, the damage was devastating. Millions suffered. Many still do. “We’re making the same mistake today with climate change. We’re staring down a climate bubble that poses enormous risks to both our environment and economy. The warning signs are clear and growing more urgent as the risks go unchecked.